The inter-universities PhD seminar in European law is organised every two years as part of Marianne Dony’s Jean Monnet Chair. This inter-universities and international seminar is designed to encourage exchanges between researchers and universities. More specifically, its aim is to give around 15 or so PhD students the opportunity to explain how their research work is progressing to several guest professors and discuss it with them, to improve their methodological approach and to pool their experience in terms of how they respond to particular difficulties that they may encounter during their research. The stay-related costs of the participants are paid for by the Centre for European Law. The working languages are English and French. The sixth summer seminar in EU law will be held from 30 August to 1 September 2017 at the Institute of European Studies of the ULB. In addition, the ECLAN network has been organizing PhD seminars in European criminal law every year since 2010.The ECLAN PhD seminar provides a friendly environment in which research students can present a topic of their choice (e.g., their envisaged PhD topic, a chapter of their PhD, a recent paper, etc.) before a panel of outstanding professors of EU criminal law, members of ECLAN, and receive comments, feedback and suggestions. The seminar has taken place in different universities from one year to the next: ULB (2010), Luxembourg University (2011), Bayonne University (2013), Queen Mary University (2014), Copenhagen University (2015), Vienna University (2016) and Basel University (2017). The upcoming PhD seminar will be held at the Faculty of Law, Economics and Finance of the University of Luxembourg on January 24-25, 2019. Applications will close on November 15, 2018. More information here. The PhD seminar is aimed at PhD students working in the area of European criminal law and holders of a degree in law, political sciences or international studies. PhD Seminar co-organised with the University of Luxembourg : “25 Years after Maastricht: Achievements, Failures and Challenges of the EU Criminal Justice Area”, 24-25 January 2019, University of Luxembourg. 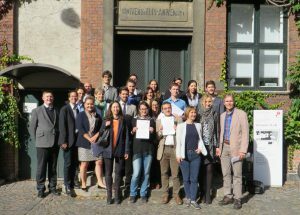 PhD Seminar co-organised with the University of Basel : “The EU Area of Freedom, Security and Justice”, 16-17 November 2017, University of Basel. PhD Seminar co-organised with Professor Robert Kert : “European Criminal Justice – Trends and research methodology”, 20-21 October 2016, Institute of Austrian and European Economic Criminal Law, Vienna University of Economics and Business.